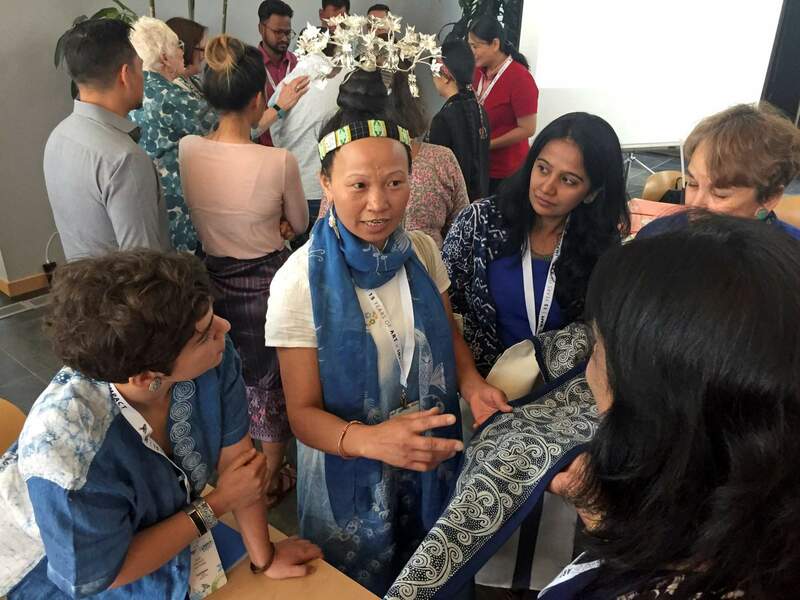 Indigo-dye textile artist Yang Xiufen, middle, of the Miao minority group in Guixhou, China, practices her sales pitch at a business workshop that help master folk artists navigate the global marketplace on Wednesday in Santa Fe. More than 160 artists and designers from across the globe who work in folk art traditions were preparing for the three-day International Folk Art Market that will start Friday. 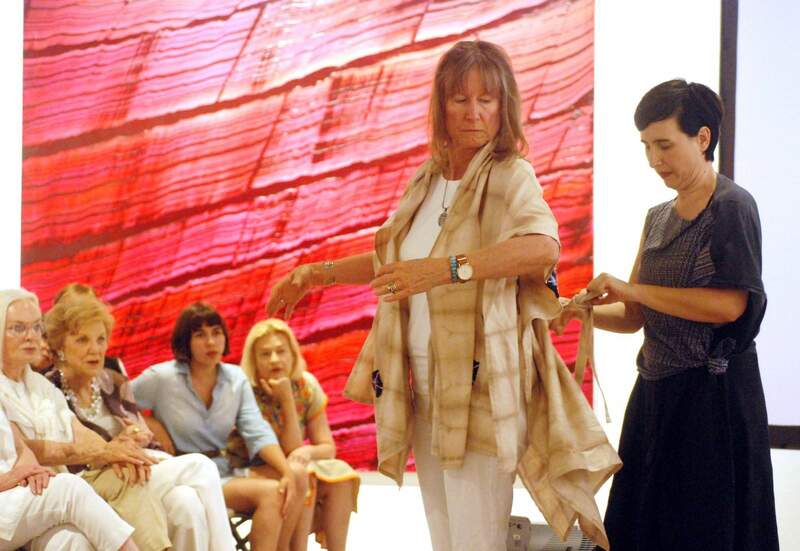 Fashion designer Carla Fernandez, right, of Mexico City and model Reagan Roby, center, show off textiles inspired by indigenous traditions at the Center for Contemporary Arts in Santa Fe. Fernandez is one of more than 160 artists and designers participating in the three-day International Folk Art Market. About 20,000 people attend the annual bazaar. SANTA FE – Nobel laureate and financier to the poor Muhammad Yunus is taking his campaign to reimagine capitalism and reverse the world’s concentration of wealth to the International Folk Art Market in Santa Fe, where visiting artists and cooperatives from scores of countries are encouraged to think as entrepreneurs. In its 15th year, the annual bazaar provides a combination of cultural exchange and an economic lifeline between consumers and international artists who work within folk art traditions. More than 160 master artists and designers are participating in the three-day market – a display of textiles, basketry, ceramics, sculpture, beadwork and metalwork. In speeches and in writing, Yunus has explained his solutions for what ails capitalism since winning the 2006 Nobel Peace Prize for founding the Grameen Bank. Starting in the 1970s, the bank pioneered the use of low-interest “microcredit” loans for the rural poor in Yunus’ native Bangladesh. Yunus condemned as obscene the concentration of wealth in fewer and fewer hands worldwide – a trend he tied to the tides of human migration buffeting the United States and Europe. He also expressed his growing concern that jobs will be overtaken by computer-driven artificial intelligence. Yunus said new businesses and financial institutions must be built upon selfless motives. On Wednesday, a Santa Fe theater troupe and marketing consultant coached foreign artists on how to overcome cultural and language barriers to communicate with Americans and consummate sales. More advanced seminars delved into business plans and export market strategies. Guatemalan rug maker Rosmery Pacheco joined in role-playing exercises and mock-sales that may help her turn a profit. She belongs to a cooperative of more than 50 women that combines traditional rug-making techniques with modern recycled materials – cotton strips purchased as bales of cast-off clothing from the Unites States. Pacheco, 24, said the craft has rescued her from cleaning houses in Guatemala as a child for as little as $10 a week. Her requests for a temporary visa to attend the Santa Fe market were rejected repeatedly since 2015 – until this year. “Everyone is sharing what they know in spite of the fact that we don’t all speak the same language,” she said. About 20,000 people attend the annual bazaar that will begin Friday. Sales typically exceed $3 million. Artists say the experience has bolstered business prospects at home – and spurred experimentation and innovation. Colombian artist Magno Mahecha is marking his sixth consecutive year, bringing to market wares from an artisans collective based in an ethnic Zenu community on the Caribbean coast. He said the experience has helped the Divino Nino collective branch out from traditional woven “Vueltiao” hats into high-fashion accessories and large, one-of-a-kind pieces – including a living-room ottoman. Sales in Santa Fe also translate into sustained work for skilled artisans who otherwise resort to selling coffee on the streets of Cartagena.